Amongst all of the awesome places we visited and adventures we had on our trip, it was often the simplest things that brought the most joy. Walking barefoot on the sand, feeling the sun on our skin, breathing in the smell of leaves after the rain. 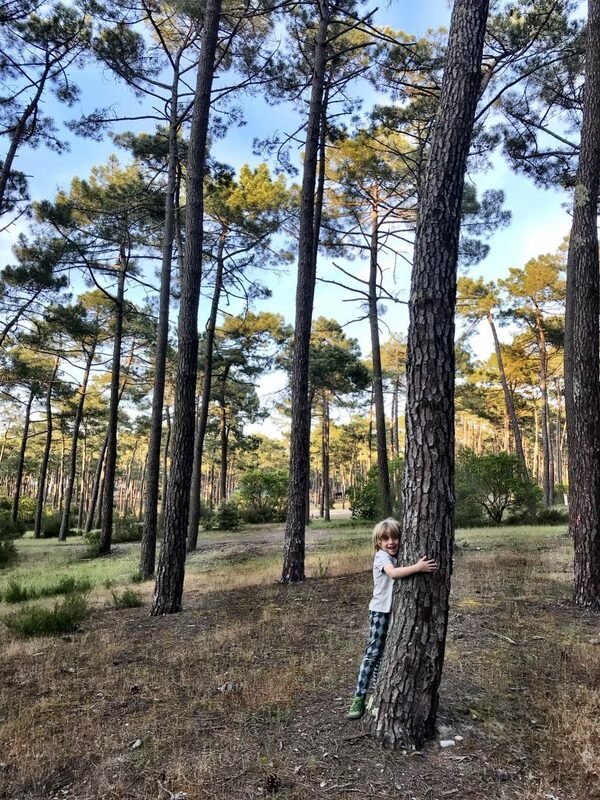 One of our very last stops was a campsite in a pine forest on the edge of Lac d’Hourtin-Carcans near Bordeaux. It was almost deserted, and whilst the pitches were carefully demarcated in theory, in reality we could spread out and take as much space as we needed to create a perfect camping idyll. 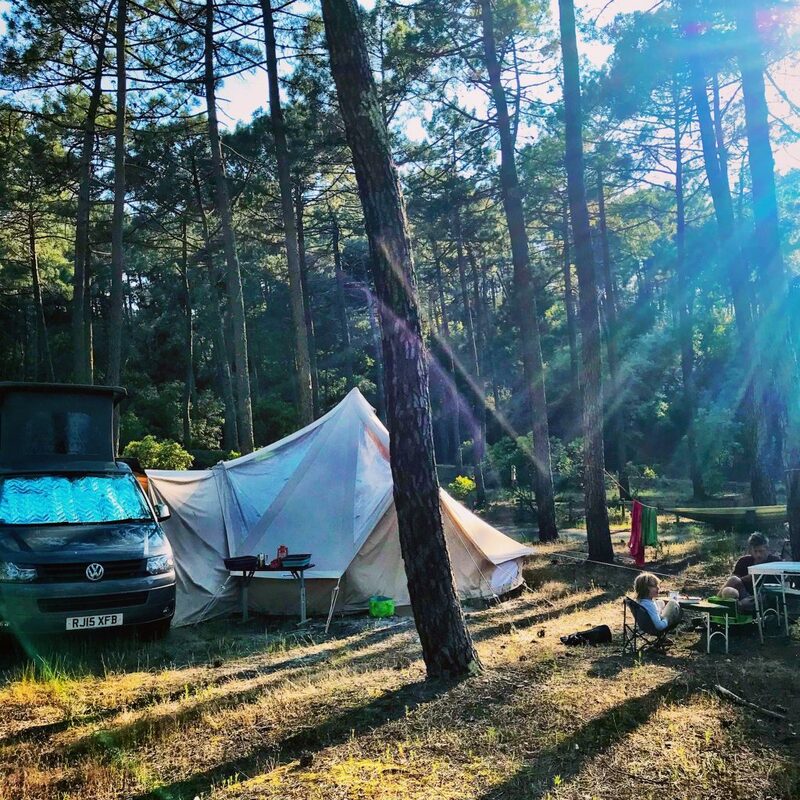 It felt like we were camping in the wild – something I’m looking forward to doing more of when Orson is a little older – but with the benefit of hot showers and clean toilets just a few metres away. As we’d driven through the vineyards to get there we had made plans to maybe do a spot of wine tasting, to follow signs to chateaus and go back and explore some of the villages we passed through. 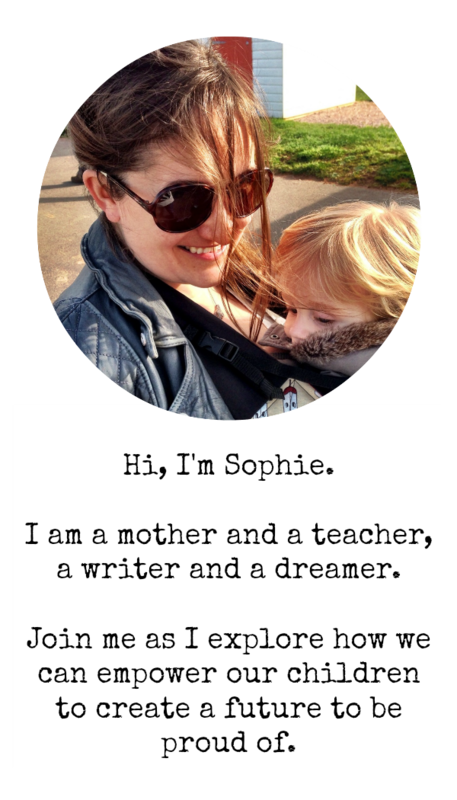 Once we arrived, though, we realised this was the perfect spot to do not very much at all – and it was exactly what we needed. 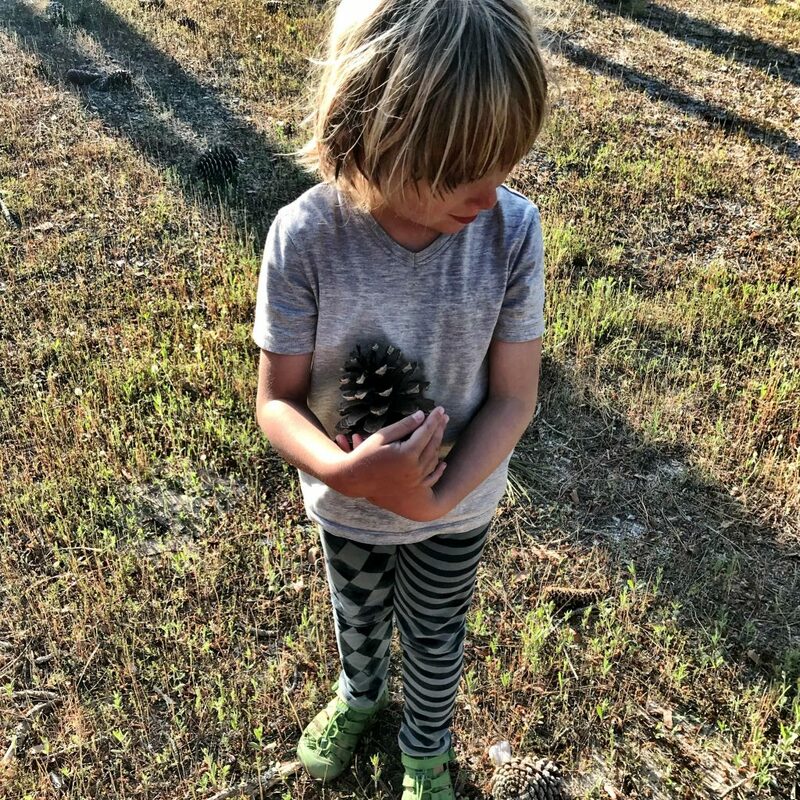 We meandered through the pine forest, listening to cuckoos’ calls and marvelling at the size of the pine cones that lay all around. The trees themselves were majestic, humbling – and created an oasis of cool in the baking sun. The lake was gorgeous – stretching out further than the eye could see with sandy beaches at its shores. It felt almost tropical, with palm trees replaced by the ubiquitous pines. We made sandcastles at its edge, paddled and swam. The water banked slowly before the depth dropped off in the centre, giving plenty of space for Arthur to build his confidence and practice his new found swimming skills. Back at camp we set up Arthur’s hammock, and it became a hub for stories and rest. We ate outside, fresh baguettes with whatever we could find in the van. 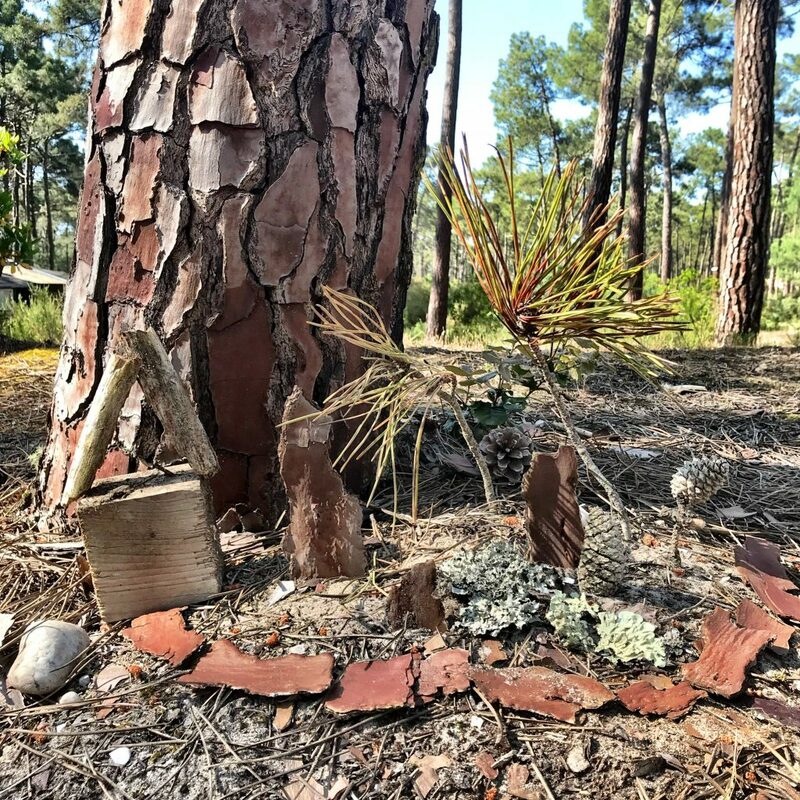 Inspired by handiwork we found by the lake we made a little garden from bark and leaves and lichen discarded on the forest floor, imagining the tiny creatures who might inhabit it after we had gone. We did venture as far as the coast – a ten minute drive took us to windswept Atlantic beaches. 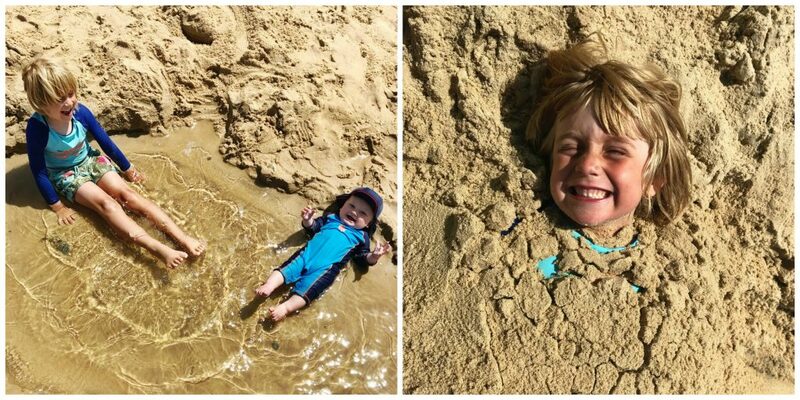 The sea was wild and cold, but the sand was a perfect consistency for play: Arthur and Leigh built a small pool where Orson could cool off safely, and Arthur insisted on being buried up to his chin. 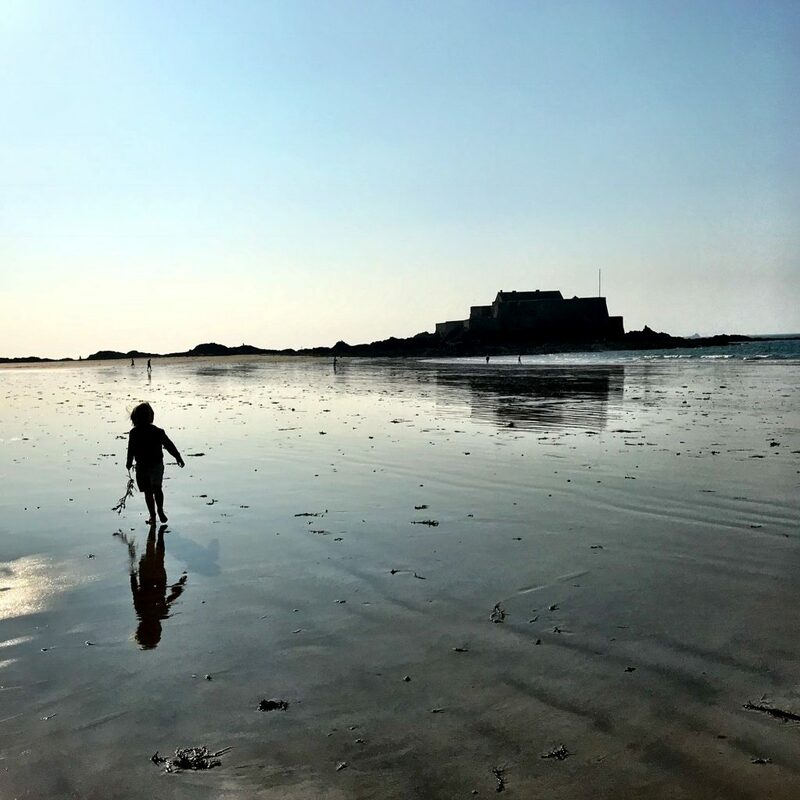 The beach in St Malo, our last stop on the continent before we boarded the ferry towards home, was calmer and spectacularly beautiful. On our very last night we walked through the city gates and soaked up the last of the evening sun as it sparkled in the layer of water left by the epic tide. 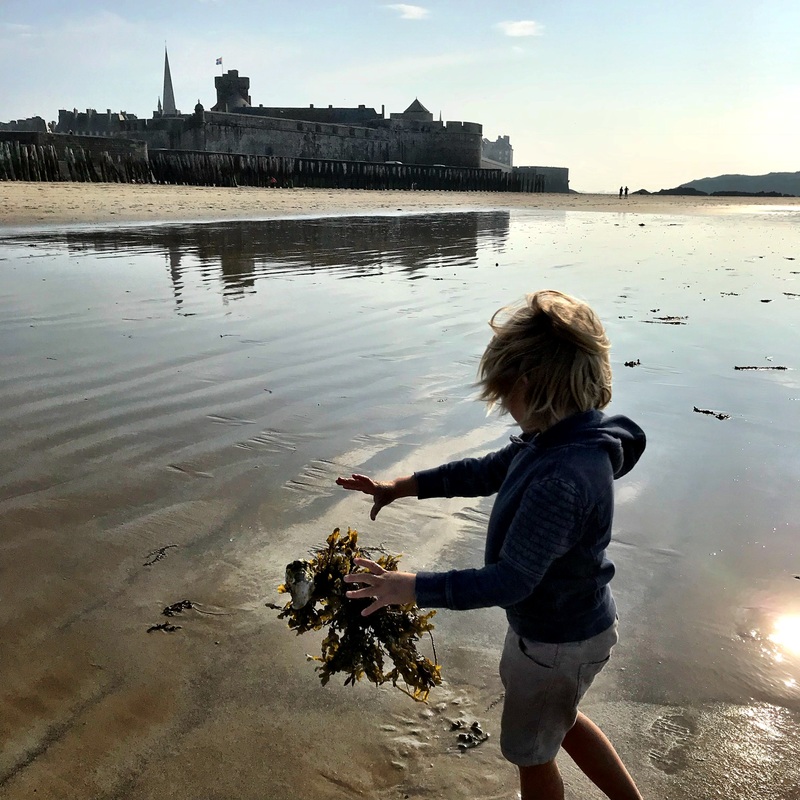 Arthur explored shells and seaweed at the shoreline, and listened fascinated as we told him of the razor clams who lived beneath the sand, evidenced by tiny holes and the worm-like mounds nearby. 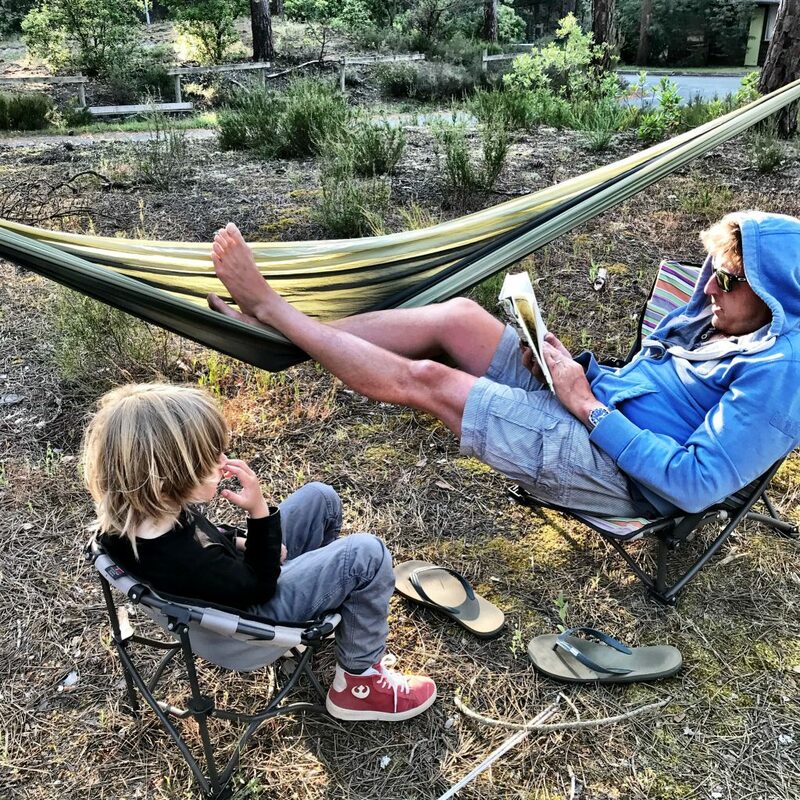 He was so happy to slow down and really focus in on the world around him – as much as all the new experiences had excited and inspired him the familiarity of nature was grounding and restoring. And the greatest realisation of all is that nothing is stopping us filling our days with experiences like this now that we’re home. To live each day as if we are discovering the beauty of our familiar surroundings for the first time: if there is one thing I am going to hold on to from our travels it is that.